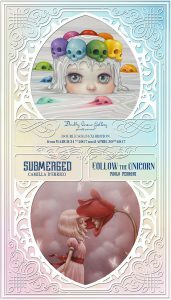 Dorothy Circus Gallery is ready to announce the roman spring with a double solo show that will host the Canadian painter Camilla D’Errico and the Italian artist Paolo Pedroni. “Submerged” and “Follow the Unicorn” blend together through the same “Rainbow” component, a major inspiration for both artists who will lead the spectator, through curious subjects and fabulous palette, on the path towards the liveliest artistic experimentations. 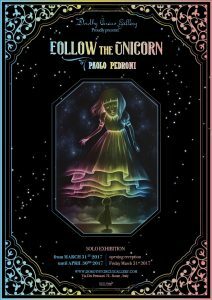 “Follow the Unicorn” by Paolo Pedroni will invite you to become part of a fairytale narrated by 10 inedited canvases. It tells the story of a child who discovers the world through the wings of a unicorn. This fantastic animal is the metaphor proving the existence of dreamlands, which do not belong to us, but can be seen by those who believe, or have the imagination necessary to create their own dimension. Rainbow is the element most often associated with unicorns. It is the bridge, the medium connecting our perceptible world with magical cosmoses. Every painting of the show is a piece of puzzle and once we “catch” all the pieces the rainbow is complete, so we can cross its colorful way to finally meet the unicorn. Paolo Pedroni, born in Brescia in May 1983, nurtured his passion for drawing since his childhood. He graduated from the European Istitute of Design in 2005. After several participations to international group shows, he finally presented his first solo show “Poison Toffee Apples” at Dorothy circus gallery, with a sold out that signed his rise in the pop surrealist scene. inspiration from the manga and comics tradition, whilst her delicate oil paint, together with ink and acrylic, derives from the study of the most refined pictorial techniques, which masterfully give iper-realistic shape to the fragments of her unconscious. Camilla D’Errico treats universal themes through her deepest subjectivity. The young melancholic nymphs show us the same parallel universe, yet their odd and various headgears are the main symbolic elements, like metaphors telling us about different stories, those regarding our multifaceted world. Born and raised in Canada, D’Errico keeps inside a colorful past and rooted passions stoked by her strong creativity and Asian inspiration. The dreamlike mélange explodes into an emotional reservoir of colors, big-eyed creatures and highly iconographic scenes. This content, reversed on the canvas, submerges the viewer into its bottomless, enchanting abyss.